You must set a valid Opsview.com Username and password in the app in order for it to be able to register itself with Opsview Monitor's push servers. 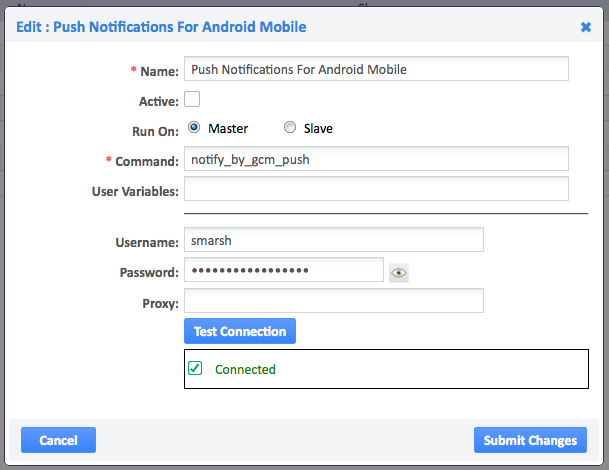 You also need a valid Opsview.com username and password in the Opsview Monitor 'Push Notifications for Android Mobile' settings fields (pictured above) so that the Opsview Monitor server can send outgoing push notifications. These two Opsview.com accounts do not need to be the same and you can use a generic account for your Opsview Monitor notification method. Your Android device must be able to do a one-time connect to your Opsview Master server in order to retrieve it's UUID for registration of the device on push.opsview.com. If the Opsview Monitor system does not have direct access to the internet, you can specify a Proxy in the text box labelled 'Proxy:' and re-test the connection. Once the connection succeeds, that is the configuration completed.